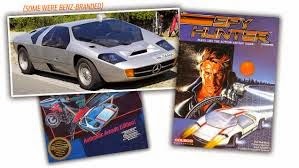 All About Spy Hunter The Game. The Spy Hunter Theme Song. Just a quick post before bed here. Going in both Music 2 for theme song and movies for the short about the classic coin op game that got ported to computer Spy Hunter. I can't remember what computer I used to play this on but i'm pretty sure I had this game. One thing I remember is the trucks to get new weapons were real hard to get on and i rarely got them if I even got that far to get a truck out. I also remembered the music as being real cool and that's why I looked up this game. I'm pretty sure it was a hard game on the port I played. I don't remember ever playing the arcade version myself. This has been a memory. Also added the label "Spy".